Since 1960, the French government has printed between 8 and 28 artist's proofs of most engraved stamps of France and French territories. The proofs are printed by the official government printer on thick art paper directly from the die prepared by the engraver. (This die is later used to make the printing plate or cylinder used to print the issued stamps.) The printer then embosses the proofs with official government seals and sends them to the engraver, who signs them and is free to sell them to collectors or dealers. Artist's proofs of engraved stamps form part of the artistic tradition of fine art engravings. They are produced for collectors, rather than as by-products of the stamp production process. For this reason, all aspects of their design and production - choice of ink color and paper, die impression, embossed seals, and the artist's signature - contribute to producing a miniature piece of philatelic art that showcases the engraver's work. Beginning in 1960, when the French government printer took over printing of artist's proofs and introduced an embossed seal as a security measure, the quantity of each artist's proof was limited to 18-28 proofs depending on the country (18 for Andorra; 23 for France; 26 for FSAT, St. Pierre & Miquelon, New Caledonia, French Polynesia, and Wallis & Futuna; and 28 for African countries). The quantity printed was further reduced to 8 in 1999. Prior to 1960, artist's proofs were printed by the engravers and no restriction was placed on the number printed. From 1961-86, artist's proofs were usually printed in six different colors (typically black, blue, green, violet, brown, and red). The shade chosen for each color often varies. For example, blue might be greenish blue (aqua), violet might be bluish violet or redish violet, and brown might be dark brown or olive brown. Other colors, such as gray, pink, yellow, and orange, were occasionally used. From 1986-98, the number of colors for FSAT and St. Pierre artist's proofs may have been reduced to five (black, blue, green, brown, and reddish brown, but no violet). However, we see various shades of brown, including light brown, dark brown and violet brown, in addition to reddish brown, so it is difficult to determine the exact number of colors. In 1999, the number of colors was further reduced to three (black, blue, and brown). We occasionally find more than six different colors of an artist's proof. This usually occurs for proofs from the period 1960-67, or where there are different shades of brown. More artist's proofs were printed in black than in any other color. There may have been 10-11 black and 3-4 of each other color (26 total) for FSAT, St. Pierre & Miquelon, New Caledonia, and Wallis & Futuna artist's proofs during the period 1960-99. Further information on colors can be found on Giorgio Leccese's website. Artist's proofs are usually printed on thick 130 x 160mm (5.1 by 6.3 inches) white art paper. Sheet sizes can vary by 1-2mm depending on the paper manufacturer. Smaller sheets were sometimes used for proofs before about 1970. Larger sheets of paper - 160mm by 180mm or 190mm by 210mm - were used to print larger dies (which can be up to 140 x 140mm) used for souvenir sheets, long stamps and some stamps printed together, such as the St. Pierre & Miquelon natural heritage tryptichs. The paper used for artist's proofs during the period 1966-98 was made by one of the three leading manufacturers of fine art paper: BFK Rives (1966-72), Arches (1973-86), and Johannot (1987-99). The BFK Rives paper is relatively thin - about 0.2mm thick or roughly twice the thickness of standard copy paper. The thickness of the paper used for artist's proofs increased after 1972 and was almost twice as thick (about 0.4mm) after 1986. The difference in thickness is noticable - the BFK Rives paper bends if held by only one of the the short edges, whereas the other papers do not. The BFK Rives is also noticably lighter - 180 gsm (grams per square meter, about double the weight of copy paper) compared to 250-300 gsm for the other papers. All artist's proofs are printed on white paper. The Arches paper used from 1973-81 is noticably less white than the other papers, and the Johannot paper is a brighter white. Most of the papers used for artist's proofs have a slight surface texture compared to the paper used for the issued stamps. The Arches paper is noticably rougher. The paper produced by all three manufacturers is watermarked with the manufacturer's name or the paper type: BFK Rives, Arches, J. Perrigot Arches Special MBM (France), and Johannot. BFK are the intials of Blanchet frères et Kléber, and Rives, in southeastern France near Grenoble, is the location of the paper manufacturing facilities. Arches is a town in northeastern France where papermaking facilities are located. Jules Perrigot worked for Arches and developed a paper-making machine. MBM are the initials of Morel-Bercioux-Masure, the mill owners in the 1860s. Most artist's proofs are unwatermarked because they are cut from a larger sheet that only has a watermark on a portion of the sheet. When a watermark appears on a proof, it is outside the die impression and neatly arranged parallel to one of the long edges of the proof. The J. Perrigot Arches Special MBM (France) watermark is too long to fit on the proof and is usually cut off at the sides and also at the top or bottom. Most artist's proofs have four straight edges. However, some earlier artist's proofs have one or more deckle (rough) edges formed by the paper pulp overflowing the paper-making frame. The use of deckle edges is not consistent - the same proof can sometimes be found both with and without deckle edges. Artist's proofs printed from 1960 on have an embossed seal in the lower left corner. The seal design was changed in 1962 to depict a hand printing press, and two additional seals were added after 1981. The seal was originally intended as a security measure but also forms an important part of the design of the proof. In 1960, the French government printers took over printing of artist's proofs, which had previously been done by the engravers. The government printers embossed a circular seal measuring 28mm in diameter on the bottom left corner of the proof overlapping the die impression. The seal reads "IMPRIMERIE DES TIMBRES POSTES" around the outside of the seal and "CONTRÔLE" in the center of the seal. In 1962, the seal was changed to give it a more artistic look. The word "CONTRÔLE" was moved from the center of the seal and placed along the outside with the wording "IMPREMERIE DES TIMBRES POSTE," and a picture of a hand press was placed in the center of the seal. The outside of the seal was made irregular to resemble a wax seal. Around 1982, two additional seals were added: (1) a 110mm linear seal reading "IMPRIMERIE DES TIMBRES POSTES FRANCE" in ornate script along the longer edge (at the bottom of the proof, or on the right side for proofs of stamps printed vertically) and (2) a 19mm image of a Cérès head in a circle near the top right corner of the proof. The stamp's engraver usually signs an artist's proof in pencil inside, or just below, the lower right hand corner of the die impression. Engravers typically sign either their first initial and last name, or only their last name, though some engravers sign both their first and last name. 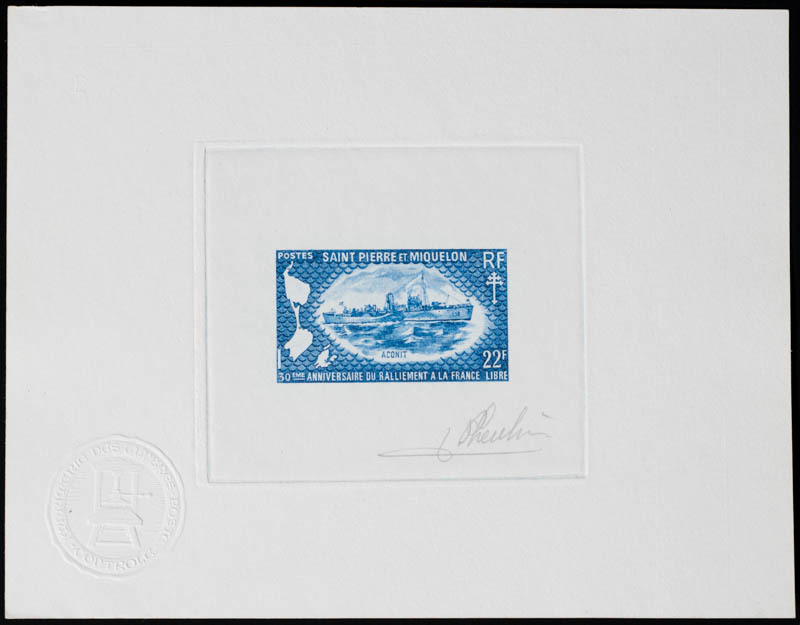 An artist's proof sometimes has a second signature in the bottom left corner for the designer (when the stamp is not designed by the engraver) or for a second engraver (when two different engravers have worked on a die, as was the case with the 1990 St. Pierre natural heritage tryptich). 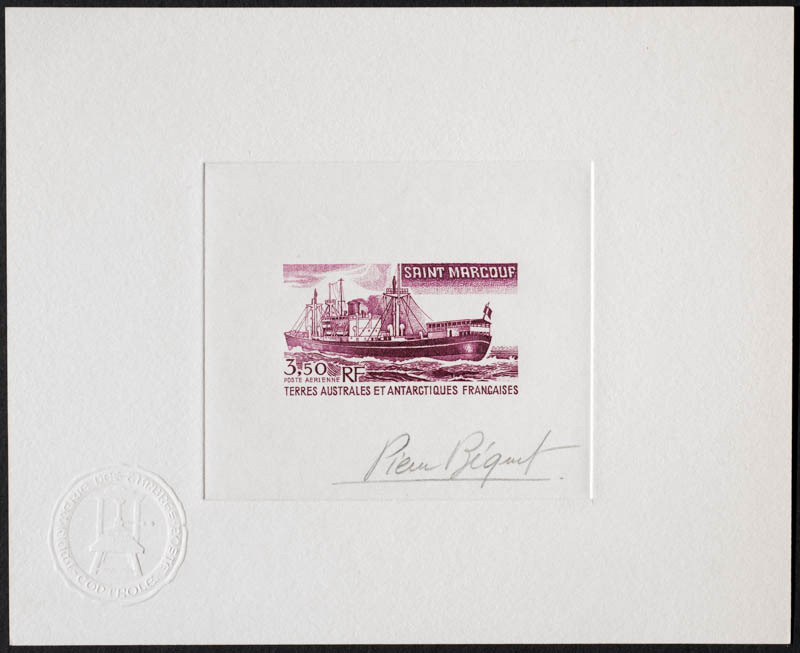 Unsigned proofs with seals occasionally exist for special issues such as the the proofs distributed to visitors of the 1975 "Arphila" exhibit in Paris, or where the artist forgot to sign the proof. Beginning in about 1973, the French government printer began printing some engraved proofs with six separate color areas using the T.D. (taille douce) 6 process. (The T.D. 6 process can apply six different colors or apply colors separately to six areas that would be difficult to do with the normal T.D. 3 die). The T.D. 6 process requires the engraver to prepare two dies, a normal die and a second die, printed in mirror image or reverse compared to the first die, for the portion of the stamp using the second group of three colors. Artist's proofs were made for each of the two dies. Since 1984, the French post office (La Poste) has produced an official philatelic document (document philatelique officiel) or information sheet for most French postage stamps. The documents are printed on high-quality A4 art paper like the paper used for artist's proofs. They contain background information relating to the subject of the stamp, a copy of the stamp pasted on the page, one or more original engravings relating to the stamp, and a proof of the stamp printed in a single color. If the issued stamp was printed by heliogravure or offset, the proof is an engraved version of the stamp specially produced for the official document. Artist's proofs of both the original engravings and special engraved version of the stamp were produced. Prices of artist's proofs range from about $15 to several hundred dollars depending on the topic, country, and circumstances of the sale. There is robust demand for the most popular topics and countries, and stamps with attractive designs are also popular. Because artist's proofs are scarce and are not listed in standard catalogues, establishing an exact price can be difficult. If you have questions about the price of particular artist's proofs, I am always happy to share my thoughts.